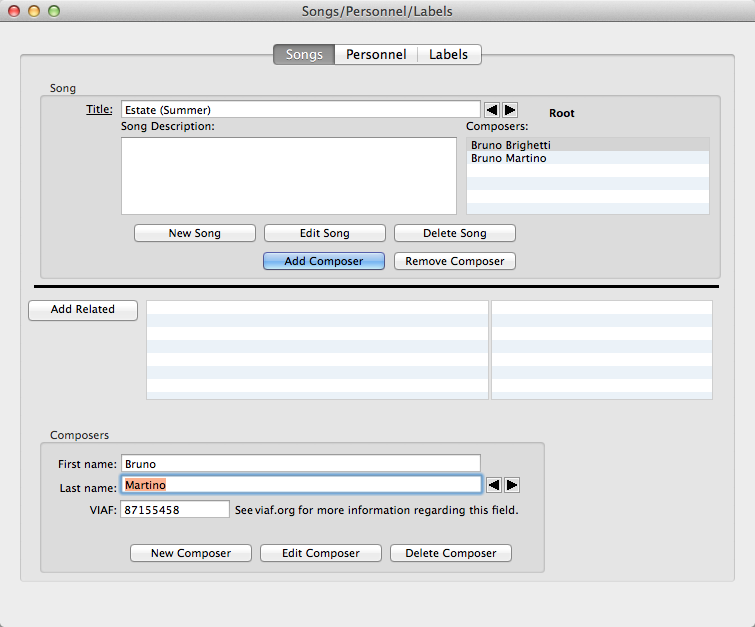 Use the Songs window to enter songs and composers. The Songs window uses the 3 step edit mode for handling the song titles, but the 2 step edit mode for handling the composers. The composers/lyricists are referred to as composers in this window because the BRIAN database does not distinguish between the two. Song Enter the full song title. The indexing for songs does not include the articles "A" or "The" when they are at the beginning of the title. Also, parentheses are not included for indexing purposes. Therefore, it is not necessary to strip them off when entering the title. Song titles may be duplicated. When trying to save a duplicate title, a warning window will appear that will allow canceling of the update in case duplication was unintentional. When entering the song title uses the 3 step edit mode. First press the NEW or EDIT button, then add or change the title. Press the SAVE button to save the changes or CANCEL to cancel them. Adding or editing the song title has no effect on the composers. Notes This field is to store any notes regarding the song. It is not used in any reports, but is strictly for the use of the discographer to keep notes. First Name The first name of the composer entry. This field is only active during adding or editing a composer name. When the window is in edit mode, this field will be used to add a composer to the composer table. Last Name When the window is not in edit mode, this field is used as a lookup field for composers. In edit mode, this field is used to add a composer to the composer table. VIAF Used to store the Virtual International Authority File id for the composer. Find out more at VIAF.org. New Song Use this button to put the window into a mode that will allow adding a new song title. When this button is pressed the Edit Song and Delete Song buttons will be changed to Save Song and Cancel respectively. Once the song data is entered, pressing the Save Song button will commit the new song title to the database. Pressing Cancel will revert the window back to the state it had before New Song was pressed. No changes will be saved. Edit Song Use this button to put the window into a mode that will allow modifying a song title. When this button is pressed the Edit Song and Delete Song buttons will be changed to Save Song and Cancel respectively. Once the song data is modified, pressing the Save Song button will commit the changes to the database. Pressing Cancel will revert the window back to the state it had before Edit Song was pressed. No changes will be saved. Delete Song Pressing this button will remove the song from the database. This action is unrecoverable. Add Composer Use this button to add a composer to the song being displayed. A valid composer must be entered in the composer field for the add to be successful. On adding, the composer name will appear in the composer list below the composer field. Remove Composer Use this button to remove a composer that has been added to a song. The composer name must be selected in the composer list. New Composer This button will put the window into edit mode for the purpose of adding a composer name to the composer table. Pressing this button will change the Edit Composer and Delete Composer buttons to Save Composer and Cancel respectively. Edit Composer This button will put the window into edit mode for the purpose of changing a composer name in the composer table. Pressing this button will change the Edit Composer and Delete Composer buttons to Save Composer and Cancel respectively. Delete Composer Pressing this button will delete the composer name from the composer table. Composers linked to songs cannot be deleted. Add Related Pressing this button will popup a new window for the purpose of relating another song in the table to the one already displayed in the window. This is further explained in the section about related songs.